I've understand how it works but in all my simulations the output (OUT pin that goes to Arduino reset) is always HIGH except when the capacitor is being discharged. Am I missing something here? Shouldn't the output be LOW at all times and only HIGH when the timer tries to reset the Arduino? Is my software wrong? My circuit wrong? or am I missing something else? From a quick look, I suspect you may have the circuit wrong. Shouldn't the 555 pin you have marked as trig (pin 2) be the threshold (pin 6)? The position of the pins might be off, but souldn't the output be the same? In the schematics TR (2) and THR (6) are shorted so it wouldn't matter anyway. Right? Oops, sorry. Didn't look hard enough. The 555 output will be high while the capacitor is charging (less than about 2/3 Vcc), only going low once it reaches that threshold. By pulsing the 'In' input you discharge the capacitor before it reaches the threshold, thus preventing the output from going low and resetting the Arduino (reset is active low). If no input is received within the time controlled by the timing circuit (the 10uF and 1m/4m and 4k7 resistors) then the output will go low and reset will occur. That's exactly what you want to happen. You need to pulse the input regularly during programme execution to keep the reset from occurring. But watchdogs only cause a restart. They tend to hide the real problem, and can cause more problems that they solve. I think you need to ask yourself whether or not you really need a watchdog. What are you expecting might happen? Can you resolve that situation by better design in your software? What will happen to your application if a reset/restart does occur? Just my opinion, but I tend to think a watchdog is not necessary in most situations. Using the simulation software (iCircuit) i've understood how the timer works, when it resets the arduino. 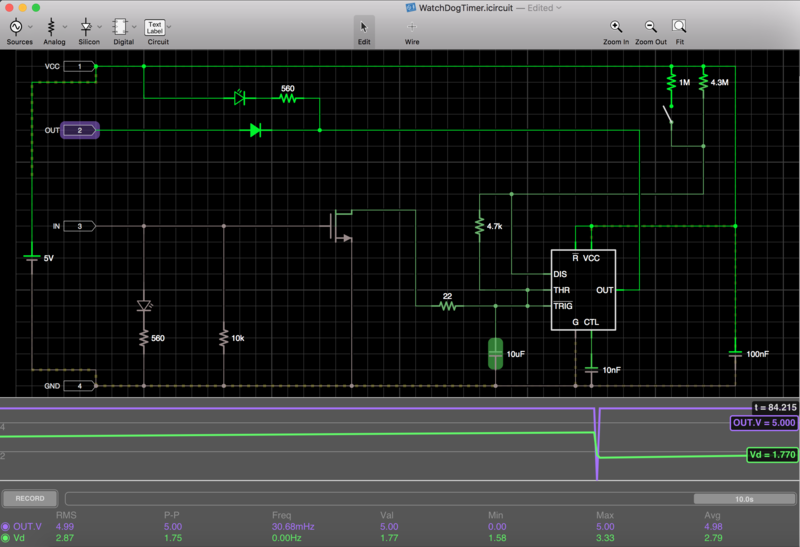 If you take a look at the bottom section of the image you can see the voltage of the OUT pin in the timeline. When the capacitor reached 3.33 the circuit called a reset, like it should do. And yet, the circuit clearly works because nobody is complaining. Where is the problem? Did I not understand something? Is my circuit wrong? Is the simulator software wrong? I'm studying about the 555 chip and I'm trying to understand how this circuit (watchdog) works. The Arduino reset pin is active LOW - meaning it needs a LOW to initiate a reset, not a HIGH. So the circuit operates correctly. The old versatile 555 is one of the greatest little devices since the transistor. Amazing what it can made to do. I'm surprised the first one did. Once again, thanks for your help.